The cuteness factor in this board book is through the roof! Reimagining the life of William Shakespeare as a sheep, everything is transformed into animalistic phrases, words, and illustrations. William Sheepspeare writes “ram-ances” instead of “romances”, and “shearious” tragedies like “Lamblet, MacBleat, and Julius Fleecer”. 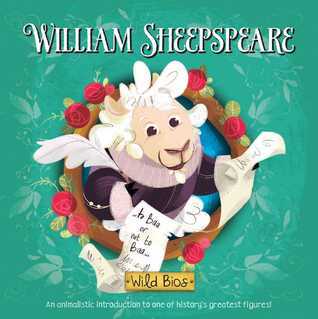 Introducing young children to the beautiful Globe Theater and Sheepspeare’s home in Stratford with his family (his “ewe, Anne Hoofaway” and three “lambs”), the simple story-telling is the perfect style for little readers to learn about this historical figure. The book even explains that no “ewes” acted in Sheepspeare’s plays, but only rams wearing ewes clothing and wigs to play the ewes parts. We also learn that Sheepspeare invented his own new words, and was asked to “hoof it” to the palace to perform for the Queen of England, who appears as a fox. The whole book is full of sunshine and adorable puns. The illustrations are colorful and vibrant, with charming details in the background that add depth to the simple story. The best part of this book is seeing all the animals dressed up in costumes for the various plays, togas for Julius Caesar, and armor and swords for MacBeth, as well as the regular fashions of Shakespeare’s day with ruffled collars and doublets. So adorable! I can’t wait to read this book with my little 2-year-old niece.